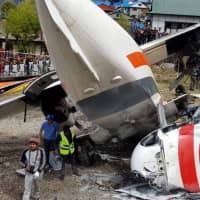 KATHMANDU - A small plane operated by a private airline in Nepal hit a parked helicopter on Sunday while preparing to take off in a mountainous area near Mount Everest, killing three people, including a co-pilot, an airport official said. Officials said the cause of the accident was not immediately known. The Lukla airport was built by New Zealand mountaineer Sir Edmund Hillary — who together with Sherpa Tenzing Norgay became the first to reach the 8,850-meter (29,035-foot) Everest peak in 1953 — as a gift to the people of the remote Solukhumbu region where it is located.